1.1 Schjødt represents the Ministry of Foreign Affairs of Iceland. Schjødt has asked us to review two loan agreements dated 5 June 2009 entered into by Iceland (as guarantor) and the Depositors’ and Investors’ Guarantee fund of Iceland as borrower (“TIF” or the “Guarantee Fund”). One loan agreement is with the UK and one with the Netherlands. 1.2 The Financial Services Compensation Scheme Limited (“FSCS”) in the UK and the Dutch Central Bank (“DNB”) have compensated depositors with Landsbanki in London and Amsterdam respectively in respect of deposit monies owing to them by Landsbanki which Landsbanki has been unable to repay. Those deposits were guaranteed by TIF up to €20,887 per depositor. The loans to be made available by The Commissioners of Her Majesty’s Treasury (“HMT”) under the UK loan and by the State of the Netherlands (the “Netherlands”) under the Dutch loan will be used by TIF to reimburse those compensation payments made by FSCS and DNB respectively. 1.3 Both the UK loan and the Dutch loan are governed by English law. • Termination Events relating to the loans. 1.5 We summarise our conclusions in section 2 (Summary). We include diagrams in section 3 giving an overview of each loan arrangement. Sections 4 to 10 then cover each of the areas mentioned in paragraph 1.4 above in greater detail. The summary should be read in conjunction with the more detailed analysis. 1.6 The background to the loan agreements relates to the obligation of EEA Member States to fulfil the requirements of Directive 94/19/EC as incorporated into the agreement on the European Economic Area, in the context of the failure of the Icelandic Banks. Directive 94/19/EC sets out the obligation to ensure that depositors are repaid up to at least 20,000 EUR (in the case of Iceland, 20,887 EUR) for each depositor when deposits become unavailable, regardless of whether their deposits are held in a bank in an EEA state or at a branch of such a bank in another EEA state. 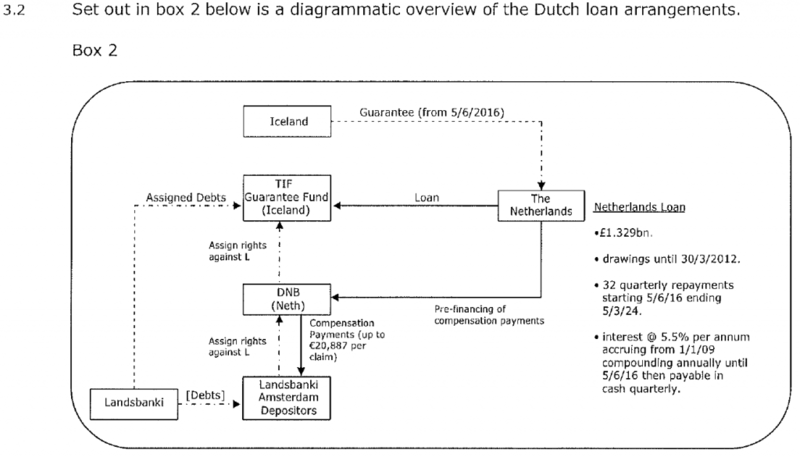 2.1 Amounts: The UK loan and the Dutch loan are made on substantially similar terms. The Dutch loan is for a fixed amount of €1,329,242,850. No further drawdowns may be made under the Dutch loan. The UK loan is for a maximum of £2,350,000,000. It contemplates an initial drawdown followed by further drawdowns after signing as further compensation payments are made to depositors by FSCS. 2.3 Iceland guarantee: Iceland guarantees outstandings under the loan agreement but the guarantee only comes into force as from 5 June 2016. 2.4 Governing law and jurisdiction: Both loans are governed by English law and the English courts are given jurisdiction to hear any disputes. This is common for international loan agreements and it is common for lenders to be able to insist on their chosen law and courts of jurisdiction. We would expect the choice of law and jurisdiction to be upheld by the English courts. 2.5 Sovereign immunity: Iceland waives its rights to sovereign immunity. As a result the UK and Dutch lenders will be entitled to obtain court judgments against Iceland if it fails to pay on its guarantee and also obtain court orders against its assets. The UK and Dutch lenders will not be entitled to obtain judgment against the assets of the Icelandic Central Bank (Sedlabanki) unless Sedlabanki independently waives its rights to immunity in respect of those assets. In addition, we have reviewed an email sent by Gary Roberts (Head of Financial Services Statutory at the UK Treasury) confirming (on behalf of both Dutch and UK governments) that the waiver of sovereign immunity recorded in the loan agreements is not intended to “extend to a waiver of the various forms of diplomatic immunity provided by the Vienna Convention of 1961. Also that [HM Treasury] will not seek to issue process or levy execution in circumstances where that would infringe upon the immunities granted to Iceland by the Vienna Convention. • whilst the Netherlands waive any further claims against Iceland and TIF in respect of the making of compensation payments relating to Landsbanki, DNB (which actually made the compensation payments) does not. However, we understand that the DNB will provide such a waiver in a separate assignment agreement the signature of which is a condition precedent to the Dutch loan agreement coming into force. 2.7 Reimbursement provisions: The loans are repayable in instalments as summarised in section 2.2. • if TIF is dissolved or ceases to be the sole deposit guarantee scheme in respect of Landsbanki depositors officially recognised in Iceland. 5.1 The UK and the Dutch loan agreements both record (a) that they are governed by English law and (b) that the parties submit to the jurisdiction of the English courts for the purpose of resolving any claim or dispute arising out of the loan agreements.6 Each lender nonetheless reserves the right to take legal proceedings relating to any dispute in any other courts which have jurisdiction. 5.2 The text of the governing law jurisdiction clause in the UK loan7 is as follows: “This Agreement and any matter, claim or dispute arising out of or in connection with it, whether contractual or non-contractual, shall be governed by, and construed in accordance with, the laws of England. Any matter, claim or dispute arising out of or in connection with this Agreement, whether contractual or non-contractual, including a matter, claim or dispute regarding the existence, validity or termination of this Agreement (a “Dispute”), shall be subject to the exclusive jurisdiction of the English courts. 5.3 It is common for international loan agreements to adopt English law (and include submission to the jurisdiction of English courts) even if the parties to the loan agreement are not themselves English. In our experience it is standard practice for the lender to select the law which will govern the loan agreement and the jurisdiction of the courts who will determine any disputes relating to the loan agreement. 5.4 We would expect the English courts to give effect to the choice of English law and to the submission to the jurisdiction of the English courts.s This means that the legal rights and remedies of the parties will be determined in accordance with English law9 and that any disputes relating to the loans or the loan agreements will be litigated before the English courts. 5.5 Each lender reserves the right to litigate any dispute in a jurisdiction other than England if it so chooses. We consider that the lenders will be entitled to do this (as a matter of English law) but will have to demonstrate that the alternative court in the alternative jurisdiction is an appropriate forum to litigate the relevant dispute and that the court in that country has jurisdiction. 5.6 Each lender also reserves the right to bring concurrent proceedings in more than one court – to the extent permitted by law. It is rare for courts to entertain concurrent proceedings so we consider this provision is unlikely to apply in most circumstances. 6.1 The general rule under English law is that a State (such as Iceland) is not subject to the jurisdiction of the English courts12 and no proceedings to enforce any judgment may be brought against the assets of the relevant State. • any separate legal entity connected with the State but only if the proceedings relate to an act done by the legal entity in the exercise of sovereign authority and the State itself would be immune. 6.3 A State (or legal entity enjoying State immunity) can, however, contractually agree to waive the above immunity it would otherwise have. 6.5 Both Iceland and TIF therefore contractually waive any immunity they may have. This means that if HMT or DNB obtain a judgment against Iceland or TIF under either loan agreement they will be entitled to enforce that judgment against Iceland and/or TIF (as the case may be) and (subject to obtaining an appropriate court order) seek to enforce that judgment against the property or assets of Iceland and/or TIF (as the case may be). An important point to note is that just because HMT or DNB obtain a monetary judgment against Iceland or TIF they cannot simply take any assets of Iceland or TIF to satisfy that monetary judgment. Is Instead they would have to take the additional step of obtaining a court judgment requiring that assets be sold or that the assets be attached in their favour and the proceeds applied in paying the judgment debt. 6.6 We understand that Sedlabanki is constituted as a separate legal entity. The UK’s State Immunity Act has a special regime for a State’s central bank and specifically provides that the assets of such a central bank” shall not be subject to any process for the enforcement of a judgment ….. or an action in rem for its arrest, detention or sale”. As such property and assets of Sedlabanki will benefit from state immunity from enforcement proceedings, detention or sale unless Sedlabanki itself agrees to waive its rights to State immunity. 6.7 The guarantee given by Iceland of payments due under the UK and Dutch loan agreements does not come into force until 5 June 2016. 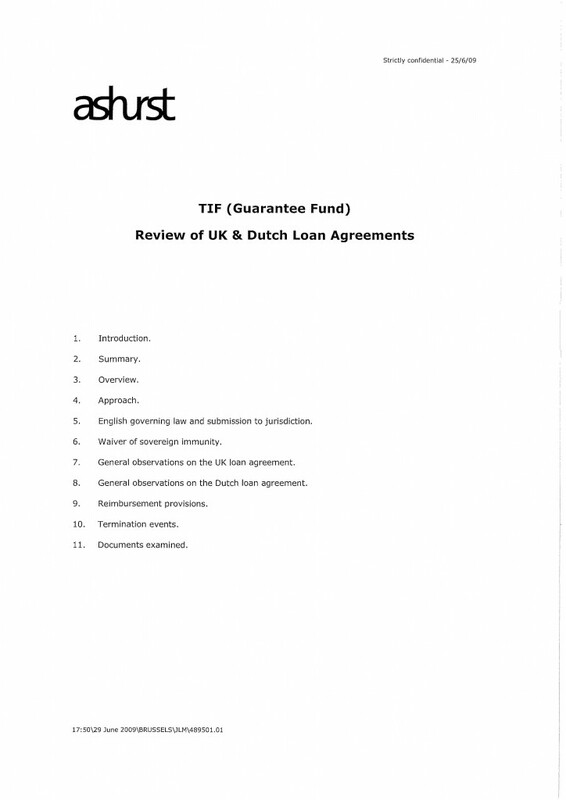 See clause 6.1 in each of the UK loan agreement and the Dutch loan agreement. Iceland cannot, therefore, be liable for monies owing under the loan agreements until that date. The lenders could not, therefore, obtain any judgment against Iceland for failure to pay and it is therefore difficult to see how either lender could take any action against any assets of Iceland prior to that date.